Back in the Permian Era of my life as a writer, after surviving the stings of more than 200 rejection slips and having finally sold a few stories (at a penny per word) to a handful of sky-fie magazines, it had never occurred to me that maybe someday I would need a literary agent. Of course, I knew they were Out There because I’d seen tons of their ads and come-ons in the pages of Writers Digest, but I didn’t see much of a current need for representation at that point given my meager output. But that all changed one weekend in the mid-seventies when my writer-pal, Charlie Grant and I were attending a raucous SF convention know as “LunaCon” in New York City. As newly-admitted members of SFWA (Science Fiction Writers of America), Charlie and I used to go to a lot of conventions back then because it was good place to meet other young writers in similar straits and also the occasional editor who might be interested in buying something from new(er) writers such as we. Quickly learning that writers liked to drink, we always headed to the hotel bar where there was always a good chance we’d run into a writer or an editor who should meet us and know we were the lean and hungry barbarians at their gates. And so there we were sitting at the elliptical bar of a hotel I’ve long ago forgotten where I ordered a bourbon on the rocks and Charlie his signature Harvey’s Bristol Cream—quickly realizing there was nobody else sitting around who we recognized. Which meant we did what we usually did, We talked to each other about the singular driving force in our lives–writing and getting published. We made room for him at the bar and we talked for an hour or two and more than a few cocktails. He told us he was recently moved to Manhattan from Minneapolis, had been a lifelong fan of SF, dark fantasy, and horror. He had an easy way of speaking with an almost constant smile on his face and he had the charm of a Leprechaun. Charlie and I liked him right from the start, and by the end of the afternoon, we were both represented by a New York literary agent. For the next year or two, Kirby kept picking up young writers of our generation like Karl Wagner, Ted Klein, George Martin, Dennis Etchison, and a bunch of others. He was our friend as well as our agent, and Charlie and I would often get into New York and run around the city with him. He had excellent radar for great bars and restaurants, and I cant ever remember him steering us wrong. Months went by, and I had continued to sell stories to some of the magazines and lots of original theme anthologies which we popular at the time. And then I get a call from Kirby who asked me point blank when I was going to have a novel ready for him. The question was that two-by-four against your head that changes everything. I paused because I didn’t really have an answer for him, finally admitting I hadn’t much thought about it yet. He chuckled and told me I’d never be a real writer just selling short stories, that I had to write books if I wanted to make a living at what I loved. Kirby had this easy confident air about him–so much so that I could do nothing less than believe him. And I spent the next few months taking out some story-ideas for test drives to see if they had enough for a long-distance journey. They didn’t—or at least I didn’t have the experience to see how they could work in the long form. I ended up with some decent short stories, but no novels. Kirby wasn’t fazed and hooked me up with a publisher who was planning to launch a new line of science fiction paperback originals, and they were looking for new (young’n’hungry) writers to help churn out 4 new titles each month—and I agreed to be one of them. The details of the entire adventure appear in my omnibus collection of MAFIA columns, and you can seek them out there. For this space, you only need to know that Kirby engineered a contract for my first novel and I got the biggest check I’d ever received as a professional writer. When I finished typing the last page of that book, I knew I had the chops to not only do it again, but over and over for an entire career. Then things started happening for Kirby—things he made happen. Picking up major clients such as Stephen King, Ted Sturgeon, Piers Anthony, Robert Heinlein, and even the Robert E. Howard estate, he was soon brokering deals for films and million-dollar advances. The little cheesy 26th Street apartment where his earliest clients, such as Charlie and me, used to crash on his second-hand couch was long gone, and I was going to parties at his new digs in a high-rise Turtle Bay penthouse condo that afforded a spectacular nighttime view of the East River. During this time of his mega-deals, he never got too big for his less successful work-a-day writers who were garnering him commissions that would barely cover his monthly restaurant tab. If you rang him up with a question or an idea, he always took your call, always had time for you. He also had made excellent connections in Hollywood and a lot of us in his stable were getting film options on our work that padded our income coffers several exponents. It was a great and heady time to be in publishing. But something changed in Kirby. All his success became . . . all his excess. He allowed his great wealth and influence to spiral him down into a maelstrom from which few re-emerge. I spent a year or so watching it happen and I knew there was nothing I could do to change things—other than move on. Charlie and some of his other mid-list clients shared similar sentiments and we all started drifting away from our dear friend, and finding other agents in town who would be able to hawk our wares. As the years passed, I saw less and less of Kirby, who had removed himself from the mainstream after he enlisted a cadre of agents led by his sister, Kaye, to form the prestigious Pimlico Agency. I heard rumors of his persistent indulgences, but I saw little evidence of them. More than 15 years ago, when I was in New York hanging out with Gahan Wilson (while we were trying to pitch a series of children’s books), Gahan suggested we go visit Kirby, adding he didn’t get out much and never had many visitors. After calling ahead, we took a cab to a modest, non-descript high-rise apartment building on the West Side. When Kirby opened the door to his small one-bedroom digs, I’m not sure I hid my shock. Standing before me was a morbidly obese man wearing a black mu-mu that did not disguise his great bulk. Staring out at me from a round fleshy face were Kirby’s bright blue eyes—the only thing I recognized about my old friend. 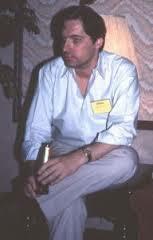 He had become this huge Orson Wellesian recluse and it stunned me. He invited us in for snacks and drinks and he was cheery and up and friendly as ever. But he was not the same skinny Midwestern dynamo I’d known so many years before. After an hour or two, I gave him a departing hug and followed Gahan out the door. Three days ago, I received news he had died of renal failure from diabetic complications. And now I sit here trying to re-capture and record the fascinating person who called himself Kirby McCauley and I suspect I’m doing a not-so-great job of it. He was an agent, sure; but he was also a huge lover of dark fantasy, sf, and horror; he was an astute editor who created one of the seminal anthologies of modern horror—Dark Forces; and he was a guy who knew how to enjoy the fruits of his mighty labors. Ultimately a bit too much. It sounds hollow to say I will miss him because he’s been among the missing for more than 20 years; and it does no good to say he could have been so much more of a beacon and a force in publishing if he had been able to harness those demons we all carry within us. So I will only end with this. Kirby McCauley was one-of-a-kind—a guy who left his mark on everything and everyone he touched—and I’m so very glad to have had him be a part of my life. Last time we visited together, I promised to do something on Thrillerfest which had been on the near horizon at the time of my last entry here. Well, life (as it often does) got in the way, and during the scant few days I had to do a blog before the day I had to take off for another convention, I was doing things like writing my daily fiction pages, sending out a mailing for Borderlands Press, learning its new website dashboard, cutting the lawn, walking the dog, and hanging out on the deck with Elizabeth whenever we could take a break. The result was no blog on Thrillerfest . . . because last Thursday I had to pack up and take off for another little convention called NECON. So you get a two-fer this time. 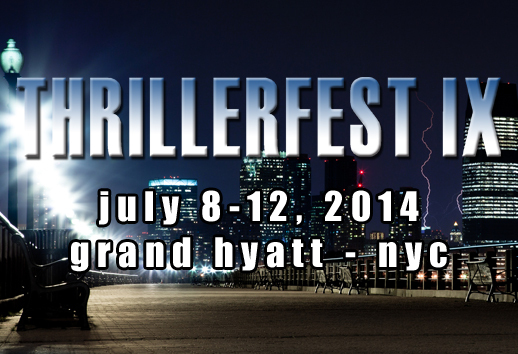 Thrillerfest is what I call a grown-up peoples’ convention. Held at the Grand Hyatt in New York City, it attracts the biggest, most well-known, and of course best-selling writers in the genres of mystery, suspense, and thrillers. There’s nobody running around in funny costumes at Thrillerfest unless you consider suits-and-ties and cocktail dresses as such. And the crowd is thick with agents, editors, and Film/TV producers, which means there’s plenty of opportunity to shmooze at the hotel bar or the cocktail hours that precede most of the big events. Its organizers take pride in presenting a highly professional venue that includes multiple tracks of panels; presentations by publishers, vendors, and alternate media; an entire day devoted to learning the craft of writing; a special event to introduce first-time novelists to the membership; and a very impressive banquet and awards ceremony. I hit the hotel around noon on Friday and found my room-mate and best pal, Paul Wilson, who was lounging in our capacious room on the 26th floor. First thing we did was hit the street in search of some vermouth for our manhattans created from George Dieckel 12-year-old sour mash bourbon. Once we located the ice machine, we were in business. We spent the day in panels and later discussions with friends and colleagues, and later that evening went to dinner with Heather Graham and her husband, Dennis, at an old Mafia hangout called Sparks, which is also a fabulous steakhouse only a few blocks from the hotel. It was absurdly good food and the company was even better. Heather is one of classiest and most generous writers in the business. Afterwards, Paul and couldn’t pass on the chance to drop into a crowded bar called Peter Dillon’s for a couple of our favorite nightcaps–that fiendish concoction called the Irish Car-Bomb. It’s a pint of Guiness with a mixed shot of Jameson’s whiskey and Bailey’s Irish Cream. The idea is to drink it down it one grand quaff. Don’t be knockin’ it till ye try it! But Thrillerfest does it right. All the new writers sit at the raised front table facing the rest of us, and each one gets introduced and gets a chance to say something about themselves and their new book. It’s a nice way to get the day started. I spent the rest of the day attending some really well planned panels on various aspects of writing a good modern thriller, and also a couple presentations by companies who have some cool innovations for publishing in the 21st century. For example, check out something called wattpad.com which looks like it could be a great publicity tool for writers. The Big Event at Thrillerfest is the awards banquet, so Paul and I climbed into our big-boy suits around 5:00 p.m. and headed down to the ballroom concourse for a really well-appointed cocktail hour. I got a chance to talk to a bunch of writer-pals including David Morrell, Doug Preston, Lee Child, and Brad Thor among others. Finally the dinner bell sounded and convention coordinator Kimberly Howe (who does an amazingly enthusiastic job) hustled me off to my table for the banquet. The repast featured sirloin cooked to perfection and fine red wine. Afterwards, the presentation of the awards went smoothly and quickly. The acceptance speeches, save one, were brief and witty and properly humble. Then it was off to the after-party, where I had the chance to meet a few new readers and fans, as well as more than a few Borderlands Boot Camp graduates like John Dixon who are now publishing their novels on a regular basis. John was touting the Boot Camp to anyone who’d listen and that was just fine withe me. The Secret Masters of Thrillerfest are smart–there’s no programming on Sunday. Paul and I packed up early and made plans for a decent getaway. But before I headed for the train station, I had a great breakfast with Tori and Tony Eldridge at the hotel. Tori had given me her novel to read and we spent an hour or so deconstructing it. It’s a big, layered, complex story that encapsulates many genres and metaphysical ideas.Her husband, Tony, is a TV and Film producer and he’s a smart, well-read guy who loves to be pitched ideas . . . so I didn’t disappoint him . . . cuz if I got anything, I got plenty of ideas. We finally left the table with promises to stay in touch and the good intentions to work on a project together, and that’s always a good thing. Fast forward a few days and it’s Thursday morning and I was packing for another convention–only this time there’s no suits or ties on board. Hey, there’s not even any long pants . . . The official name of my destination is the Northeast Writers Convention, but it has always been called “NECON” as long as I’ve been going to it–which is since 1986 or so. It’s a place where, writers, editors, agents, artists, and readers get together to simply have fun. I’ve always liked it because it’s not like any other weekend that calls itself a convention. Oh sure, they have panels and a meet-the-authors party and an interview with the Guest of Honor and an art show . . . but they also provide stuff you just don’t get a other gatherings of the clan. To wit: There’s a series of competitions called the NECON Olympics which includes things like foosball, darts, and miniature golf; there’s an artists’ reception with wine,cheese, and pastries; a talent show where lots of people rosked getting gong before winning a valuable prize; a game show that requires encyclopaedic knowledge of all things horror and dark fantasy (but mostly movie stuff); a “celebrity” roast; a NECON Hall of Fame induction ceremony; a Hawaian shirt contest, a midnight saugie-fest; and there even used to be a softball game between the writers and the fans (until I got tired of organizing it . . . and it just faded away). For many years, the venue took place on the Roger Williams College campus in Bristol, Rhode Island. We would also sleep in dorm rooms and eat in the college dining hall. It was comfortable, reasonably priced, and a perfect setting for all the hijinks (always wanted to use that word). We now meet and party at the college’s off-campus Conference Center where the rooms smell like seaweed and we all try to ignore that truth. And of course there are parties all the time, especially the ones in the atrium after the sun goes down. For some reason, there always seems to be mass quantities of alcohol at these events. I have no idea why. Anyway, I have this tradition of traveling to NECON with Doug and Lynne Winter and F. Paul Wilson. It starts when Doug picks me up as he heads north from Virginia, then we drive up to Paul’s where we stay the night before getting up early for the drive up to Rhode Island. There’s always lots of good conversation and plenty of laughs along the way. I’d like to be able to convey the unique feel and flavor of NECON, but its one of those things you need to experience. By the time we are packing up for the nine-hour drive south on Sunday morning, we are exhausted from all laughter, libations, and liabilities. If you don’t believe me, try it yourself. I’m not sure I’m all that jiggy with doing a blog on a regular basis–although I can see the benefits. Biggest problem for me is finding the time to get this activity into my schedule. It’s not a question of coming up with stuff to write about because I doubt I’ll ever run out of opinions or observations or experiences on which to comment. It’s been a few days since I returned from Williamsburg VA where I was a guest at a convention called Scares That Care, and I guess I should spend a few words on that gathering of the clan. It’s a horror convention with an ultimate goal of donating any profits to charity. A noble endeavor, that. The organizers wanted to raise 20K, and although they didnt make that goal, they finished in the black–a worthy accomplishment for the first year of operation. I’m thinking they need to move the venue nearer to a larger metro area and they will do just fine. They had plenty of horror film personalities in the Celebrity Room, and the had tables for all the writers as well. You don’t get as many readers as film geeks to these weekends, but you get enough to make them a lot of fun. It’s a chance to have a few cocktails and hang out with your friends and readers and make some new friends as well. Next week, my bro from another mom, Paul Wilson, and I will be heading up to NYC for ThrillerFest which is a big, lavish weekend where we all get to put on our big-boy pants and wear our suits and hang out with all the bestselling writers in the suspense/thriller genres. It’s a great opportunity to network as well as talk to film producers, editors, and even your agent. I’ll post a report next time. Having just returned from a gathering called the North Wildwood Writers Conference, I have a few thoughts on this one, as well as many other conferences where I’ve been an invited speaker or instructor. Most of the people who attend these things like the *notion* of being a writer . . . rather than the reality of being one. Most of them have *never* submitted their work for publication—even to online, non-paying venues. A majority are terrified their work will be negatively criticized. A majority are poor-to-fair writers who need healthy doses of honest line-editing and deconstruction of their work. Which basically says they are afraid to be real writers. If they continue to let their apprehensions control their desire to write, it’s just not gonna happen. I remember being equally intimidated when I started sending my execrable tales on their appointed rounds to the science fiction magazines of the seventies. At some point, I accepted rejection as a necessary part of the process of becoming the writer I needed to be. I racked up an impressive count of more than 200 rejection slips before I sold a story to Amazing Science Fiction for a penny a word. I got my first check for $30.00 . . . and it was all the validation I needed. If I could do it once, I could do it again, and countless times afterward. And when I go to these gatherings of bored housewives and retired execs, I don’t try to teach them grammar or style or storytelling theory. My only goal is to leave them with a determination to write a page or two every day and send out every finished piece of work. After a while, the rejections no longer hurt . . . they just piss you off.